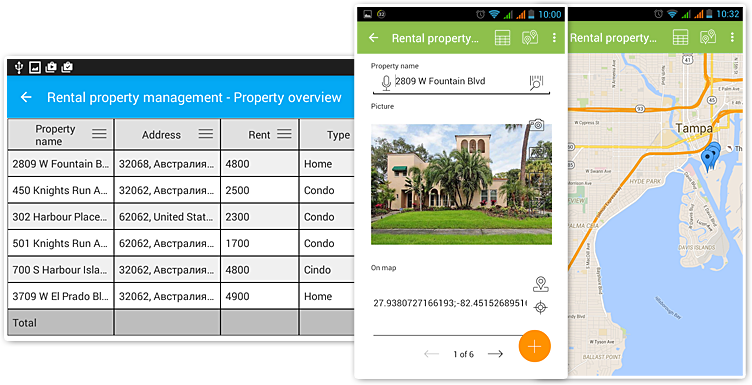 MobiDB Database is a general purpose relational database app with multiple user access and synchronization for iOS, Android and Windows 10. Cloud synchronization turns MobiDB database app into team database. Designing database is similar to Bento app for iPad. Design database and input forms using Visual form designer. 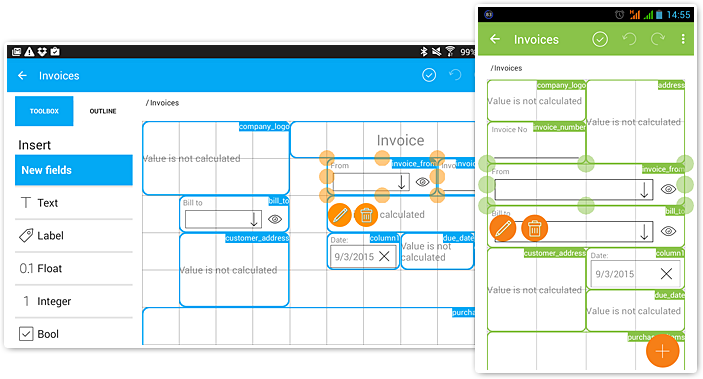 csv import enables data exchange between mobidb and MS Access, Filemaker, Excel. Import entries from csv to create a new table or to the existing tables. Export created databases to PDF or print the entries. MobiDB is great Personal database organizer app as well as Business database app. MobiDB is a perfect suit for field workers. It supports Geo GPS coordinates and suits for geologists, archaeologists and etc. to track custom entries. With more then 20 field types you can keep track of any data and is a perfect tool to organize your life and work. It's a nice tool for inventory, project management, orders, customers database, invoices, organizing deliveries and also suits for managing spends, home inventory, meter reading, controlling health sugar/blood pressure indicators, organizing different types of collections. What MobiDB Database can do? It's able to design relational databases with multiple tables and complex relations (One-to-many, many-to-One, Many-to-many), calculated values, export of the database entries to CSV and PDF for further use in external apps. Synchronize databases on all your devices including iOS, Android and Windows stay connected with your team. MobiDB Database enables users to view the records in a table view. Table view is highly customizable - it's possible to change columns width and order, sort and filter the entries. You can view your data as a separate card which provides detailed information, such as extended text notes, pictures and photos. It's also possible to view your records on map if you entered any GPS coordinates. Label the entered locations, proceed to details and add new entries right from the map view. MobiDB Database is the perfect way to keep track of personal and business data: belongings, orders delivery, travels and trips, inventory, invoices, project management and any other item you want to list. 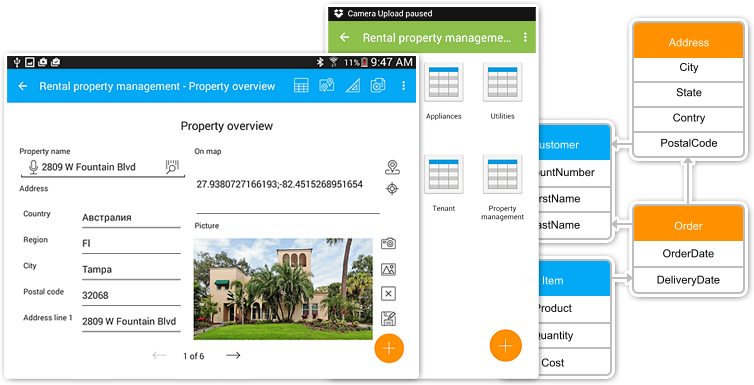 The app is a good fit for property and store owners who need to manage some stuff and funds, project managers who need to maintain projects and manage the team, couriers and travelers who need to store locations and be able to view them on map and many other business users. The created databases can be synchronized and used on iOS, Android and Windows 10 devices. It is possible to share a database via Dropbox, Google Drive, One Drive to collaborate on with your team, friends or family members. All changes from different users are also synchronized. Best wishes, download MobiDB database app. More than 20 field types are supported: string, float, checkbox, date, hyperlink, email, phone, picture, address, etc. Synchronization via Dropbox, Google Drive, One Drive makes it possible to work with the databases from different devices: desktop, tablet, notebook, phone with iOS, Android or Windows 10 installed. You can contact us using the form below or by sending us a direct email.